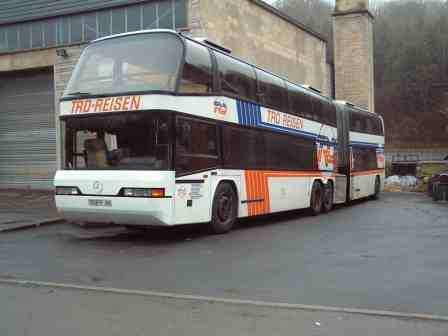 Above - The ex-Best Tours bus now owned by us - see end of this page. Atlantic Coast PLC have recently purchased the Neoplan N138 Jumbocruiser belonging to the Fischer company of Dortmund. We will be modifying it to be a super luxury tour bus / sleeper coach / motorhome in the style of our existing Neoplan Skyliner. Keep an eye on these pages while we report on the conversion due for completion Easter 2002. Our old vehicle is for sale at £50,000 + VAT - it comes with new air conditioning and a refitted upper deck. Here is our diary of events and some pictures. On November 2nd 2002 Lotti made her last trip for TRD from near Dresden to the Neoplan Headquarters at Pilsting and the house of the company's boss. She was driven by regular driver Heinz Fahrenstück who has decided to retire now. On November 5th I collected her from the TRD yard at Dortmund - some tears were shed and I was moved. The journey home was uneventful except that I could not understand the heating controls and at first had a cold journey home. Overall impressions were that Lotti is more stable than my old Skyliner and gave a better ride, especially in the trailer. The steering is very light and precise (too light really) and the brakes are progressive and stop well. The Allison automatic gearbox was a bit jerky and the retarder did not seem to work. Noise levels in the cab are very low from wind and road noise which is nice. I think Neoplan must have got their act together over plug type air doors between 1985 and 1986 as these doors close airtight unlike those on the Skyliner. The upstairs roof is too low for my taste. it is at least 3 inches lower than a British market Skyliner upstairs. Since then things have not moved very quickly but they are moving steadily. 2) Replace gearbox oil with Shell instead of Castrol - made one helluva difference. With Castrol the gearbox was reluctant to work when cold and retarder was useless. With Shell the gearbox works straigh away when cold and the retarder sort of works (still poor compared with that on the Skyliner). Unfortuantely I think they overfilled the gearbox and we may have a very slowly leaking oil seal - not sure if that is what it is or whether it is blowing out of some sort of breather. 3) Fitted an electric horm - the air horns are incredible but not really what I want. 6) Replaced steering track rod ends on trailer (had to be cut off) and aligned front and rear steering - was well out. 7) Replaced some wires, pipes and air valves as preventive maintenance. 8) Replaced most of the fan belts. I then took her to Heavy Duty Parts to have the seats removed (and sold). These coaches always look strange inside when empty of seats. The next destination was Chris Langson's Starline company to have the front and rear ends modernised and you can see the pictures below still in TRD colours. At the same time 2 x 240v electrical air compressors for the auxhillary tank whn parked up and the air doors were fitted key controlled air door controls for passengers to control the doors securely while parked up. As I write Loti is in Nailsea having air conditioning and a Panda silent DC generator fitted. There is no room for any air-conditioning pumps on the engine so the idea is that we fit two big electrical compressors. While the engine is running the two alternators on the engine will charge the batteries and will feed a 6kw invertor. While parked up the DC generator will do the same thing. It is a neat idea having a DC generator because it can sense when the batteries are getting low and will start automatically. Being a near silent generator no-one will complain about noise. In a couple of weeks Clemes Behle of Coachservice near Dortmund will visit to discuss how we are going to fit Lotti out as a sleeper coach. We have decided it is too complicated getting Lotti authorised as a British coach (despite marvellous assistance from government departments who were keen to help) so she will operate under a partnership arrangement between Atlantic Coast and Coachservice as a German vehicle. New front with Mercedes badge. Still in TRD colours at present. New rear light clusters and reduced size of emergency exit on back section. 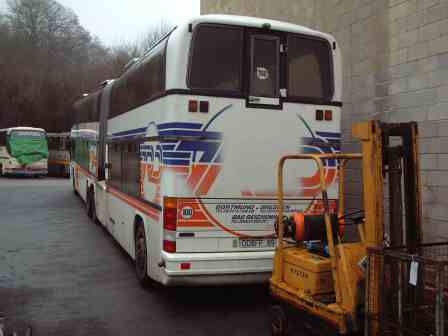 Have had the bus at Neoplan UK for a couple of weeks to sort out the anti-lock brakes and an oil leak. I think the ABS has not worked for years as 4 sensors had to be replaced, one of the two ECUs and some wiring. I also had a fantastic Navigation system fitted. I have looked at one or two but the Siemens VDO Dayton system seems to be the best. Don't buy two country disks like I did, just use one country disk for the whole of Europe or else buy the 8-country pack for the same price as 2 countries. The oil leak that I suspected was a blown seal on the gearbiox due to overfilling turns out to be just a connection to the power steering pump. Collected from Neoplan and next day the ABS light comes on and the oil leak reappears! Delivered coach into Coachservice at Reichshof. They will be fitting the bus out according to their own superb standards once all legal tests have been completed. 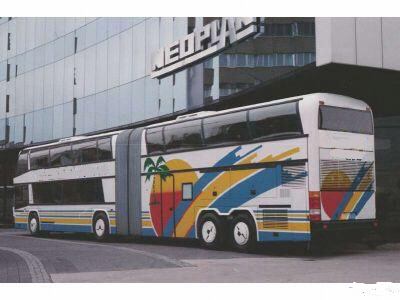 Neoplan have come back with a price for painting the coach - £15,000 - hmmmmmm. Have devided to have it vinyl wrapped for a bit over £1,500 - even if the vinyl degrades after a couple of years they quote a 5 year guarantee) I am still better off. Well things are going really slowly - I was hoping to be inspecting an almost finished vehicle by now but in fact all that Coachservice have done so far is move the vehicle to near Hahn Airport it seems. They want to sort out the toilets and showers first but no decisions have been made. I am getting a bit down about it. Meanwhile Andreas Schenider has sent me a photo of a model he has made of Lotti. he asks me to point out that the model is not for sale and will not be building any more so please do not contact him about it !!! Well I am getting realy depressed. I have invented a joke. "You know that Germans have a reputation for having no sense of humour but are very efficient? Well Coachservice people have a great sense of humour"
After spending some time near Hahn airport the people there decided that some mechanical work and internal welding needed to be done but never got round to doing it. There was a further delay while some guys who were familiar with Lotti set up a new workshop facility somewhere near Regensburg and now they are doing it part time it seems. I made my point with Coachservice and they are feleling very guilty about it all but we have agreed to stick it out for now in Germany rather than bring her back to England and actually get the work done. The only reason I am keeping Lotti German registered is that we would have to cut emergency exits into her if she becomes British registered and will be limited to 16 passengers not 20 as in Germany - on the other hand she would be on the road by now earning a living. I am getting stories like the back brakes did not work etc but of course you always get such problmes when such a bus is left doing nothing for a year. Oh well...I am not going to be too critical of Coachservice because they are good people and have their own business priorities but as I said, it is depressing. if I leave too much longer I will not be allowed to drive Lotti as I will be too old! Good news... just got the following from Coachservice. Lotti is doing better and better. Brakes are done; the bodywork is very much but almost done, the sunroofs are finished. The whole body will be noice isolated soon. The hydraulic systems will be checked what happens with the leak. I expect the bus to return to our yard by the end of March. We should have our new buses finished by than and start on Lotti. I presume it makes sense that David comes for checking the air ventilation and channels etc. in the beginning of April and then we go from there. Let em know if this sounds like a plan..
Just got back from visiting with Coachservice.. They drove me blindfolded to a secret location near Würzburg where I was delighted to see that the whole vehicle is fundamentally rebuilt. Much of the monocoque has been rewelded with new box sections everywhere and the service gear like the brakes, the power steering and the engine has been overhauled or at least very carefully checked. This is the difference between the British attitude of "let's get it on the road and earning now and sort out any problems when they occur" to the German one of making sure no problems occur in the first place but we will not earn any money meanwhile. I expect the German version is probably the better one but as a Brit I find it frustrating. We have another 3 weeks of welding to do and the coach moves back to Reichshof for completion of the air conditioning and installation of the interior that will now sleep 12/14 but carry 20. Now in an insurance company parking lot in Brussels with M.r Stefan Boone inspecting the turntable. Yes I have now gone completely Gaga and bought this basket case - except underneath the depressing exterior is an almost new coach ready for a renaissance. This coach chassis number 9118345 was built in 1992 under the specific instructions of Mr. Stefan Boone of Best Tours in Brussels. Unlike previous Jumbocruisers, this coach has the power unit mounted right at the rear driving the last trailer axle. The other axle on the trailer is a fixed twin wheel unit. The engine is a Mercedes 440 ps V8 and power is by an air controlked gear connection system on a ZF box. The danger of a pusher is in wet conditions where the back section is still trying to push the frot section so an automatic gearbox would not be safe. The coach was built to carry up to 80 passengers in extremely comfortable seats with full leg support, better than most business class seats in planes. The usual route was Belgium to Spain on high intensity work. Around 160,000km from new the coach was rolled. At first the insurace company claimeed against Neoplan for making an unsafe vehicle but eventually it was established the cause was due to driver error while handling a cup of coffee at speed. 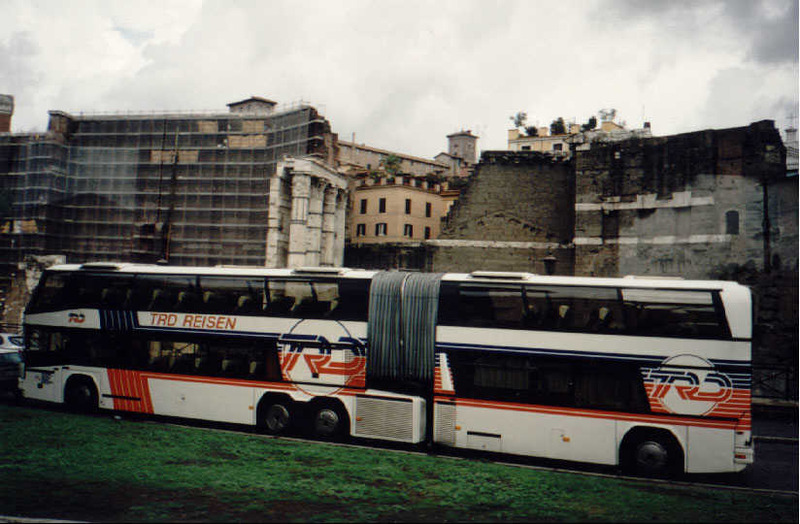 This coach was tested at the Nurburgring by Neoplan and also by Michellin at Clermont-Ferand at speeds in excess of 140km/h. There were issues regarding snaking but these were resolved by using computerised rams similar to anti-jack-knifing systems on trucks. In great lines, we see 3 phases: repairing the accident and renovate the body, adapting the interior to your wishes and last but not least, a complete technical round-up of this coach. Starting with this last point, we intend to built out engine, gear box, retarder and to check/ evt.renovate them. New radiator, intercooler and oil cooler. New hoses, thightenings, belts, ... Standard exchange starter, dynamos, ... Completely revisioned heating, airco, ventilation system. On all these jobs you get a one year or 100,000 kms guarantee, except for the engine, gear box and retarder on which you get two years of guarantee or 200,000 kms (whatever is reached first). The weakest point of this mechanical chapter will be the articulation. I told you about the coaches history and you are aware of this central "computer", which is the "Achilles-heel" of this coach. For performing the best as possible in repairing this damaged articulation, I called in the specialists that builded it: Hymer Leichtmetallbau from Wangen, Germany. They let me know that, after the "debacle" with some of these articulations, they stopped to produce them and they sold this division about seven years ago to HÜBNER, also in Germany. There I got in contact with mr.Uwe Sippel, whome seemed to be willing to help us. I have to mail him some more detailed specs. before this week-end. He promised to come back with an answer before next Wednesday. 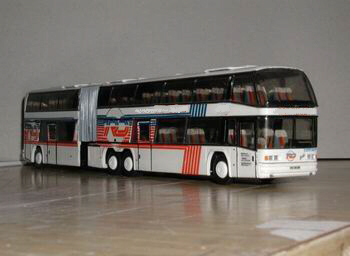 We hope you can understand that we can only give you the guarantee that Hübner is going to give us on this articulation.For safety reasons you and I agreed that the coach will be speed limited at 100 km/h and that no more then max 20 persons will be on this coach while driving. While repairing the damaged body, we suggest that we give it as much as possible the new Skyliner-look and that we put in the darkest windows available. Our electrician is also looking for how to change the complete dashboard. About the inner lay-out of the coach (we spoke from 16 beds, some leather seats and a well equipped kitchen) I suppose we set up a meeting specially for this purpose. But anyhow, we did already more of these projects and by experience we know more or less where we will end with times and prices.